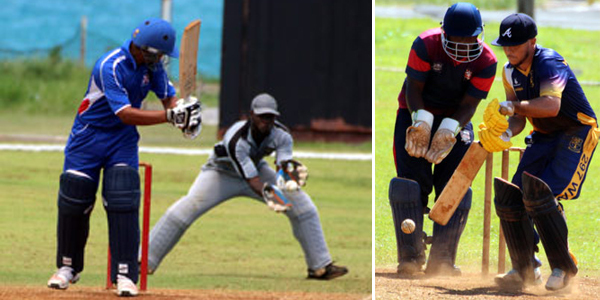 Both St. David’s Cricket Club and PHC recorded victories in this weekend’s First and Premier Division cricket action. At Lord’s in St. David’s, the home team won the toss and elected to bat, captain OJ Pitcher led the way with 100 not out as they scored 296/7, Shea Pitcher added 74, Jordan DeSilva was the pick of the Somerset Cricket Club bowlers with figures of 10-1-40-3. With only 1 over bowled during the Somerset Cricket Club Inning and the score on 9, the heavens opened and no further play was able to be played. At the Sea Breeze Over 18 wickets fell with only 149 runs scored in this First Division match. PHC won the toss and elected to bat, they were bowled out for 74, Jade Morrissey was the top scorer with 14, while Dalin Richardson was the pick of the Bermuda Under 18 bowlers returning figures of 6-1-11-3. In reply the Bermuda Under 18’s scored 75/8, with Jabari Darrell the top scorer with 16, Darrin Anglin returned figures of 6.3-0-33-4 to lead PHC, while Bancroft Haughton had figures of 6-1-14-3.